What a good idea to open a concert whose main work is Ein Deutsches Requiem with Schicksalsleid. The choir is already there and it creates a valuable opportunity to hear a live performance of something which doesn’t get too many outings although, as James Morgan told the audience at the beginning, Schicksasleid is one of the finest things Brahms ever wrote. This rendering of it was eloquent, mellow and nicely paced – and it clearly showed how well The Dome works for a large, impressively competent, choir such as Brighton Festival Chorus. The acoustic is warm but also allows for an incisive edge against which Morgan’s tempi were well judged. Morgan is a perky and insouciantly witty presenter as well as a conductor and he treated us to an unadvertised education workshop on the Requiem between Schickalsleid and the interval, drawing attention to some of former’s most interesting moments. I’ve sung it many times but still learned from this entertaining 15 minutes. 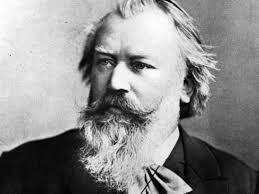 The best was the “historical re-enactment” of the first performance when a piano marking was omitted from the timpani part so the player played forte throughout the third movement which put the public off so much that Brahms didn’t risk a second performance for a whole year. Morgan gave us a sample of what this would have sounded like and it was very funny. And so to the marvels of the Requiem itself with its seven movements, musical and narrative symmetry and emphasis on comforting the living. Morgan has a real gift for bringing out the detail, such as the double bass pedal in the opening, allowing the harp to dominate briefly where it’s appropriate, letting us enjoy the contra-bassoon and making sure we noticed the beautiful pizzicato passages in the central fourth movement. The final, peace and resolution-bringing movement was particularly fine with some enjoyable flute work. There was excellent singing from the choir too with nearly all entries tidy and very little strain even on demanding high notes. And Morgan’s dynamic control was well observed so that there were some moments of real Verdi-style tension.